Provocative, puzzling, and visually seductive, in his first museum survey Alex Da Corte’s neon-bright, exuberant works merge the languages of abstraction and modern design with banal, off-brand items, ranging from shampoo to soda to tchotchkes and household cleaning supplies. Acid-hued and organized with a rigorous formal logic, Da Corte’s mash-ups mine products of domestic life—which he finds on pilgrimages to supermarkets, flea markets, and dollar stores—for unexpected visual appeal as well as emotional and libidinous impact. Heir to Pop artists of the 1960s, Da Corte combines common consumer objects with popular culture, personal family narratives—and other artists’ work—in vibrant installations of sculptures, paintings, and videos. Taking over MASS MoCA’s second-floor galleries, Free Roses features a selection of works made over the last ten years, as well as a major new installation, which serves as a conceptual fulcrum for the entire show. The centerpiece of the exhibition is a sprawling new ensemble created for the museum’s 100-foot long, 30-foot tall gallery. It is the artist’s sixth installment in a series of works based on Arthur Rimbaud’s poem A Season in Hell. The young 19th-century poet’s angst-ridden prose—about self-knowledge, work, and love—is mirrored in Da Corte’s references to his suburban upbringing, teenage desire, family relationships, love, and loss. Also on view are three videos inspired by A Season in Hell, along with a suite of table sculptures—a series originally developed from props used in the videos. 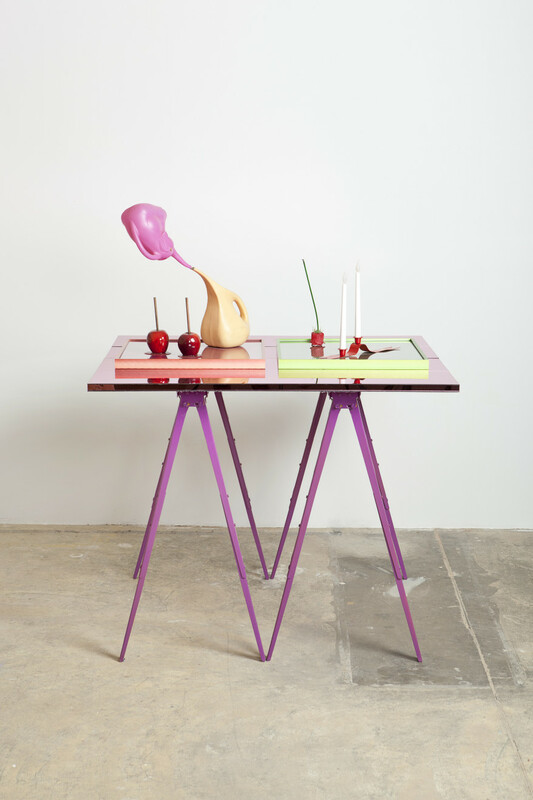 Meticulous arrangements of items such as picture frames, plastic grapes, a Wiffle bat, and hair rollers placed atop a surface supported by sawhorses [Untitled (Buffet)], 2012, read like sophisticated time capsules. Like his predecessors Mike Kelley, Paul McCarthy, and Jim Shaw, Da Corte investigates the cultural and psychological narratives invested in the objects he manipulates. The exhibition features two of Da Corte’s most important video works. The first is the seminalChelsea Hotel No. 2 (2010), named for Leonard Cohen’s song of the same title, which provides the soundtrack. The work can be understood as an index of Da Corte’s vocabulary of materials, colors, and processes. Two hands—variously covered in flour, dirt, aluminum foil, and packing tape—manipulate foodstuffs and objects, including bread slices, bananas, grapes, cherries, bologna, and lettuce, as well as a plastic grocery bag, broom, and IKEA chair. The video bursts with color featuring a bright orange bucket, a robin’s egg blue plastic bowl, and cherry-red soda. Ketchup, soda, and nail polish mimic both paint and bodily secretions. As a study and a performance of color, texture, movement, sound, smell, and desire, the video brings to mind a number of precedents including the performances of the Viennese Actionists, as well as Fischli/Weiss’ 1987 film celebrating the magic of making sculpture, The Way Things Go, and Richard Serra’s Verb Listfrom 1967–68 (Da Corte’s version might read “stacking bread,” “shaking soda,” and “squeezing ketchup”). Da Corte has long been interested in sets and stages—be it a television set, music video, opera, or cartoon, or more invisible kinds of stages and special effects, such as the cardboard shelf holding a stack of AXE body wash in the corner store. He explores the notion that artifice is everywhere, while examining the masks and props we use to create meaning in our lives, and also to deceive ourselves.